After extensive client interaction and practitioner sensing, the Joint Fire Science Program determined that a lack of integration of data, software models, and systems is a huge, costly, and continuing problem. Existing fire and fuel models are generally stand-alone, difficult to 'string' together, problem-specific, lacking support, and not accessible to all stakeholders. Therefore, information technology governance is challenged because development standards do not exist resulting in redundant and fragmented efforts. 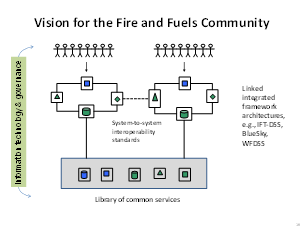 JFSP is funding development of a web-based, service-oriented framework architecture for fuels treatment planning as an example and potential stepping stone towards a larger inter-connected system-of-systems (S-O-S) framework for wildland fire. This data and software integration framework is called the Interagency Fuels Treatment Decision Support System (IFT-DSS). It is currently in development and testing. While our current efforts are focused specifically on fire and fuel management, the methods, guidelines, and processes we discover in development of IFT-DSS will be applicable to a whole host of natural resource decision support information needs. The bottom line is major savings in time and effort to complete comprehensive fuel treatment analysis across all landscapes. Visit our project website for more information.